Platini had worked as a special consultant to Blatter from 1999 to 2002, and in 2011, Blatter approved a $2 million payment that he said was back payment of salary owed. There was no written contract detailing the payment, and Platini has described it as a “gentleman’s agreement” to cover the rest of the money he was due. 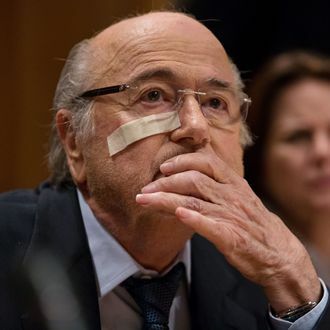 But FIFA investigators found the timing suspicious, as it came shortly before Blatter began campaigning for his fourth term as president of the sport’s governing body, with UEFA throwing its support behind him. “I’m really sorry,” he said. “I’m sorry. I am sorry that I am still somewhere a punching ball. I’m sorry that I’m as president of FIFA this punching ball. I’m sorry for football. “I am sorry for the 400-plus FIFA members. I’m sorry. I am sorry about how I am treated in this world of humanitarian qualities. I’m sorry for the Federation Internationale de Football Association. Platini is expected to appeal the decision as well, though the ruling seemingly ends his chances of running in a special election in February that will determine the next president of FIFA.